Empirical Political Analysis introduces readers to the foundations of social science research. Organized around the stages of the research process, this textbook prepares readers to conduct both quantitative and qualitative research, from the formation of theory through the design of research projects, to the collection of data and the analysis of results. It offers a clear and concise presentation of basic concepts and tools that can be applied in a wide range of research settings and highlights ethical conduct in the research process. It will help you both to achieve sound results in your own research and to critically evaluate research presented by others. 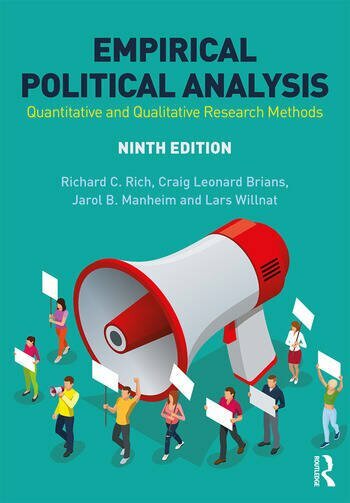 Offers comprehensive coverage of quantitative and qualitative research methods in political science – this book is one of the key texts in the field of political research methods since it was first published over 25 years ago. Covers the research process from start to finish—hypothesis formation, literature review, research design, data gathering, data analysis, and research report writing. Includes in-depth examples of political science research to give discipline-specific instruction on political analysis. Features a "Practical Research Ethics" box in every chapter to make students aware of common ethical dilemmas and potential solutions to them. Includes learning goals, key terms, and research examples to help students engage and explore the most important concepts. Updated and international case studies. New material on understanding research design – what constitutes a sound research design and how this contributes to being able to justify research findings. Richard C. Rich, PhD, studies and teaches about environmental policy, public policy analysis, and research methods. He was Editor of the State University of New York Press Urban Public Policy book series that won the Aaron Wildavsky Award for Contributions to Policy Analysis. He was formerly Chair of the Department of Political Science, Director of the Center for Environmental and Energy Studies, and Director of the School of Public and International Affairs at Virginia Tech.